PHILADELPHIA -- Julie Ertz was perhaps the last person associated with the Philadelphia Eagles to find out she is going to Minneapolis in two weeks for the Super Bowl. The poorly concealed smiles of other members of the United States women's national team at halftime of Sunday's game against Denmark were a clue. But even if things were going well in the NFC Championship Game on the other side of the country, she reasoned, the NFL playoffs could be strange. She didn't know for sure the Eagles and her husband Zach Ertz were winners in their game until the final whistle in her game confirmed a 5-1 win for the United States. "I was kind of looking around for someone to give me confirmation and answers, and I feel like I needed it from at least like three people to make it feel real," Ertz said. "Yeah, I just got super-emotional." What each spouse described beforehand as a first -- playing at the same time in games of significance -- turned out about as well as they could have possibly imagined. 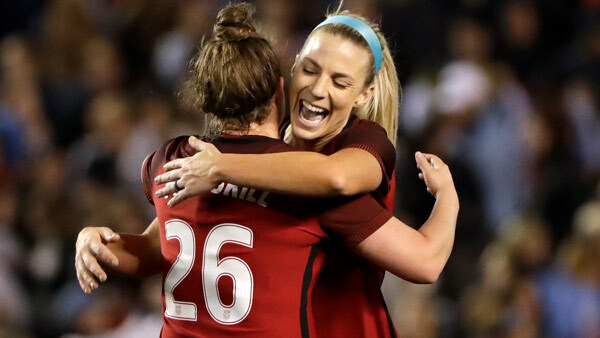 The reigning U.S. Soccer female player of the year, Julie scored what turned out to be the winning goal in the 19th minute as the U.S. erased an early deficit and rolled to victory in its first game of the year. And Zach led the Eagles with eight receptions for 93 yards in a 38-7 win against the Minnesota Vikings. But given the start times -- the soccer game kicking off an hour after the football game -- neither could watch the other. And while they joked in the days before about a way to relay scores through family in the stands holding up posters, Julie insisted her entire focus was on the field. She was one of just five U.S. players to play the full 90 minutes. Only after the fact did the communication resume, from others and eventually from Zach. She got a text message that said simply they were going to the Super Bowl and then more. "He FaceTimed me right when I got in there," Ertz said of the locker room. "So, of course, I was again really emotional but super excited. "I'll call him a little bit later. He's going to celebrate with the boys and cheer. They're enjoying their moment tonight. But I know for them, it's back to business tomorrow." For her, there is some time to be a fan, as Zach was when she won the World Cup final in 2015. The U.S. team wrapped up its annual January training camp with the game against Denmark, and Julie won't have to report to her National Women's Soccer League team until later in February. That means the calendar is wide open for a trip to Minneapolis.